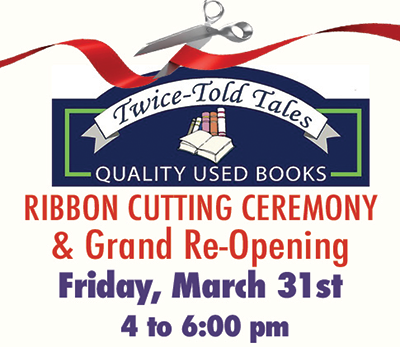 Everyone – booklovers and the just plain curious – is invited to celebrate the reopening of Twice-Told Tales, on Friday, March 31st from 4 to 6 p.m. 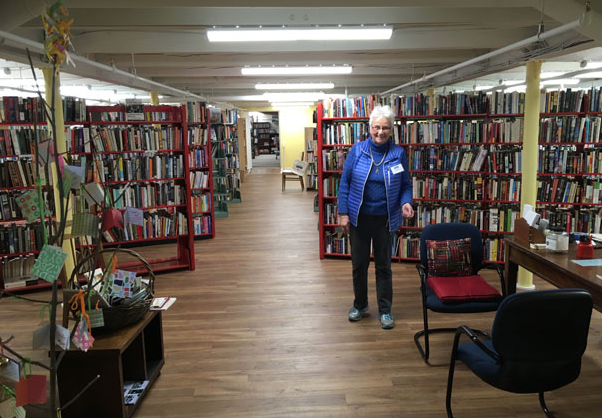 Enjoy refreshments and admire the new location of the quality used bookstore on the lower level of its original location at 11 Pleasant Street. The bookstore quietly opened its doors for business on March 11 after having been closed for renovations since late December. The larger store has been spruced up with fresh flooring, lighting and a cheerful coat of yellow paint. Expanded shelving now accommodates many more titles in all categories, from reference books to fiction – classics to bestsellers — mystery, history and biography, health and parenting, travel, cooking, crafts, gardening, children’s from board books to teens, together with CDs, DVDs and audio books. Twice-Told Tales is sponsored by the Friends of the Curtis Library and is manned entirely by volunteers, many of whom will be on hand at the reception to welcome guests and to provide an introductory tour of the store and the behind-the-scenes spaces. The store was founded in 2105; all purchases and donations support a variety of Library programs and activities.